Olvera Properties could not have made it easier for us to purchase a house in Spain. Anne Marie, Zoe and Ian were extremely patient and truly went the extra mile every step of the way–from finding the perfect home to applying for our NIE’s to even arranging electric services. Even more importantly, they introduced us around in the community so we immediately felt right at home. As estate agents these people are the best, hands down. Just a short note to express our thanks for everything. I think its fairly obvious from the newly restored spring in the step and glint in the old baby blues how absolutely thrilled we are with our wonderful new home. We will not hesitate to sing your praises to all and sundry. In fact I would say to anyone thinking of doing business with you to just consider how many estate agents they have ever dealt with would be invited to the housewarming! Your VIP invites to our rooftop Fiesta will be winging their way come spring have no fear. We recently sold our townhouse through Olvera Properties and the level of professional service which we received has been outstanding, totally surpassing our expectations. Where to start? Well, Olvera Properties’ comprehensive knowledge and analysis of the local and international property market is very impressive. Their skill in marketing our property to the widest possible range of potential buyers – both in Spain and internationally – was undoubtedly a major factor in the successful completion of the sale of our property. Olvera Properties brought a whole range of skills to bear – comprehensive knowledge of the local area and customs/culture, language skills, practical advice, excellent contacts in the local community (e.g. financial institutions, the local council, and every service provider from plumbers to language teachers in both the Spanish and Expat community), all-round helpful friendly service and – perhaps best of all – patience, perseverance and good humour. Nothing was too much trouble, no problem was insurmountable! Zoe, Anne-Marie and Ian really looked after us through every aspect of our house sale and we are absolutely delighted with the end result. However Olvera Properties is more than an estate agency, it is a social hub and a contact point in the community of Olvera and for good reason. If you are looking for a property in the “real” Spain, or are looking to sell a property, look no further. We simply can’t recommend Olvera Properties highly enough. We first visited Olvera in May 2009 and fell in love with the town and the beautiful surrounding countryside. We decided straight away that we wanted to buy a holiday home in the town and we contacted Zoe at Olvera Properties and told her what we were looking for. We found Zoe to be extremely professional, helpful and friendly and not at all pushy. Despite several “viewing days” we didn’t see anything that was quite right for us but Zoe was determined not to be beaten and carried on searching for us. We finally found our dream home, made an offer and completed within three weeks! Zoe made sure we were kept informed of what was happening throughout the purchase process and “held our hands” on the completion day. We can’t recommend Zoe highly enough. Having spent much time in Spain over the years on our quest to find the ideal location to purchase a property. We discovered Olvera for the first time in March 2010 and our decision was made. With plenty of help and valuable advice from Zoë, 6 weeks later we were proud owners of a fantastic town house, with breath taking views of mountains, blue sky’s and sunsets. 2009 was certainly a banner year. Not just for you, judging by the positive notices in the Olive Press, but also for us. John and I realized a life long dream of buying a house in Spain and we found just the ticket with your help. 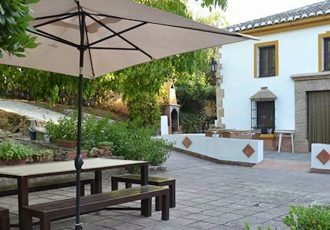 We had been looking for about a year, but on the Costa de la Luz, and unfortunately found the places we liked just a tad out of our price range. Since we will be living on a fixed income when we move to Spain on a permanent basis we did not want to saddle ourselves with a mortgage and then worry about the vagaries of dollar vs. Euro exchange. 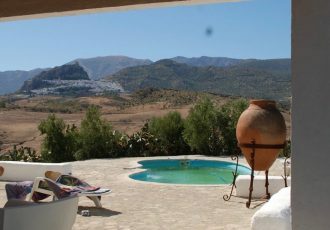 And then, one lazy summer afternoon, John did a web search on properties in other parts of Andalucia and some of your properties cropped up, and, best of all, most of them within our price range. So we contacted you and made the supreme effort to come to Olvera for a look-see (Hey ! it’s hard work, but someone has to do it !) Make a long story short – we are now the proud owners of a lovely house(s) in Olvera (unless it has been washed away by the interminable flood), and as a bonus got to meet you and your family and Anne-Marie, who has been doing a splendid job of watching over the casita and putting things in order with the plumber, handyman, and several of the authorities dealing with gas, water, and electricity. Thank you again for all your help. John and I are looking forward to our first tapas party and becoming full-time Olvereños in the not too distant future ! In doing so we will add yet one more Welshman to the contingent. Following the death of my partner I decided to sell our flat in Zahara, a daunting task at the best of times. Without the help of Zoe and her team I would have been completely lost, not only did they bring the sale to a happy and rapid conclusion, but the legal team were on hand to ease tax and death duty problems. It is impossible for me to recommend them too highly, in these days of uncertainty, to find such a completely honest and trustworthy firm is rare indeed. We dealt with Olvera Properties for both the buying and selling of our house in lovely Olvera and we can’t recommend them enough. They helped make the process simple and stress free, which as first time buyers in Spain we were not expecting! They were always on hand to help with queries and problems long after we had bought our house. Olvera was a great place to live and we left with fond memories of both Olvera and Olvera Properties. 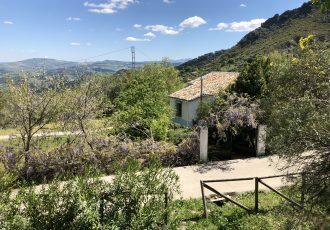 We had been looking to buy a house in Spain for several years, our search had spread south from Sierra de Gredos, via Extremadura, Aracena and finally to Olvera. We first found Olvera Properties following a web search, the varied list of properties for sale, and the refreshing nature of the property descriptions with photos, convinced us that we should pay a visit. So in late 2008 our first visit (well not quite, I had passed through Olvera in 1992) and the general feel of the town, and the people, were positive. A brief short list of properties that we liked the look of resulted in arrangements being made for viewings. It took a few more visits and more lists of potential properties, Zoë’s patience was endless but it was all worthwhile. We finally found something suitable the following Easter, and a couple of months later the purchase was complete. Throughout the transaction Zoë of Olvera Properties ensured that the process was as stress free as possible, and gave valuable assistance (and time) in sorting out our NIE formalities. Moving to a new property, many people like to tweak things a little, and Zoe had the contacts for various jobs that we wanted to have done on our casita de pueblo, all of which went very well. Christmas 2009 we had our first family get together in our new home, which was very enjoyable, and we are now looking forward to spending more time there in the coming months to take advantage of the warm weather and the welcoming atmosphere, and of course those superb Olvera views from our new roof terrace..